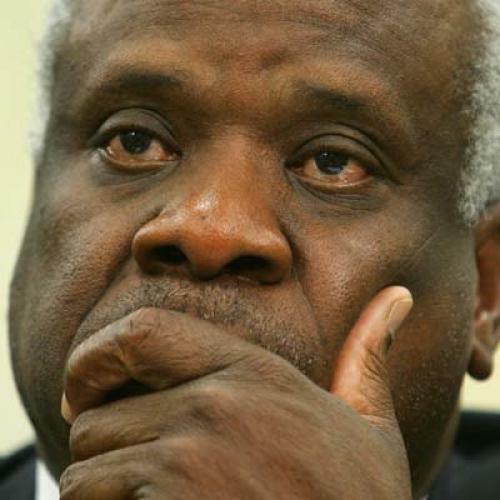 The three-day marathon Supreme Court hearing on Obamacare is over and, to no one’s surprise, Justice Clarence Thomas didn’t say a word. The justice has long-been famous for his silence on the bench, having spoken just once since 2006. We decided to determine precisely how many times Thomas has spoken during oral arguments since he joined the bench in 1991. The task seemed pretty simple: just search through the Supreme Court transcripts. But due to the quirks of the Court’s archival history, it turned out to be nearly impossible. We soon learned that until 2004, the Supreme Court’s official transcripts of oral arguments didn’t identify the speaking justices by name. The judges’ comments on these documents were anonymously attributed—just preceded by a generic “QUESTION” or “UNKNOWN SPEAKER”—leaving us to wonder why this seemingly key piece of information was purposely omitted from such historical documents. Kathleen Arberg, spokeswoman for the U.S Supreme Court, said she doesn’t know why judges’ names were previously omitted from the transcripts, and she isn’t sure what prompted the policy change to include their names in 2004. Arguments were only sporadically transcribed before 1968, she said. During the first years when the Supreme Court officially started transcribing oral arguments the justices and attorneys were identified by name. From 1972-2004 the attorneys were named in the transcripts but not the justices. So if you wanted to know which robed figure said what, without listening to the tapes, you were out of luck. While no definitive explanation to these policy changes could be pinpointed, some Supreme Court experts speculated that the Court had some quixotic idea that the questions and comments should be coming from a unified court, and not from specific justices. But Dennis Hutchinson, professor of law at University of Chicago, said the answer to the missing names is probably far simpler and could have something to do with the court reporters not being able to decipher who was actually speaking. Without these archives, coming up with an exhaustive and definitive list of the times that Thomas has spoken would be a large undertaking, unless of course you’re willing to listen to 20 years of Supreme Court audio recordings. Fortunately, the Oyez Project at IIT Chicago-Kent College of Law—a multimedia archive devoted to the Supreme Court of the United States and its work—is currently in the process of listening to the audio files from the Supreme Court hearings to add the justices’ names to the transcripts prior to 2004. Researchers for Oyez said that in the beginning stages of its project it has identified nine instances that Thomas spoke from the time he took office until 2004. (They have not yet transcribed the audio recording from 1994-1999, so this figure excludes these five years.) Since 2004, Thomas has spoken three times. But it turns out that Thomas’ silence isn’t just a joke for Supreme Court followers. It has also caused some trouble for the Oyez project itself. Jerry Goldman, a research professor at the Chicago-Kent law school, said Oyez—which now manually identifies the voices—was initially relying on computer software to help determine which justice was speaking but ran into a number of technical difficulties. Among the many problems: Justice Thomas didn’t speak enough to give the software a large enough sample to accurately identify his voice.